Most runners hit a slump during the marathon training process. It could be a mental or physical slump, but for many runners the weeks of training take their toll. As your energy lags, enthusiasm is low and it becomes hard to keep up with your training plans. 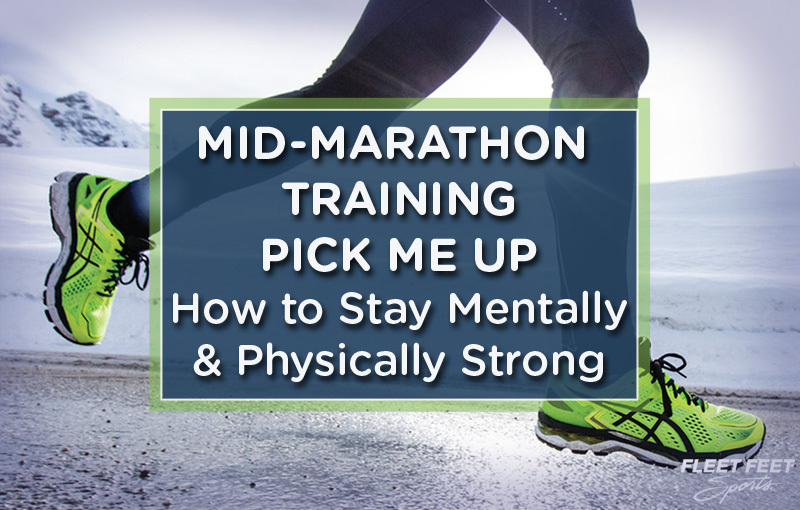 Thankfully, it is possible to regain your mojo and get your training back on track. We’ve got you covered! Identify your stressors - Check in with yourself to see what’s wrong. Are you overtraining? Are you sleeping enough? Is work or family life very busy? How is your nutrition – are you eating too much or too little? Are you under the weather? Once identify the cause, you can work on fixing the problem. Trust in your training - Are the doubts and what-ifs starting to creep in? Trust in your training and all those miles you have been running. Believe in the foundation you’ve created! Take your last long runs to practice nutrition and fluid intake to build race day confidence. Fleet Feet has a variety of nutrition and hydration choices to suit your tastes and needs. Move on - Had a bad run? Everyone does, even the elite runners. Learn from past runs and put negative experiences behind you. Dwelling on poor runs drains confidence and motivation. Focus on the positives and you’ll realize this is a temporary blip in your training. Revisit your goals - Why are you doing this in the first place? What do you hope to accomplish for this race? Remembering why you are running can help bring back the spark and excitement. Review the course - Review the course and picture yourself crossing the finish line. Most races post a map and/or a video of the race course which takes away any fear of the unknown. You will know what to expect and can train for any unexpected terrain. Pump up the inspiration - Do you need new sneakers or gear? We have some great gear that can boost your enthusiasm for training. A GPS watch can help keep you on pace and track your mileage. Even a new flavor Honey Stinger or Gu can give you something to look forward to. Take a break - For physical slumps, a few days rest could be the motivation you need. You could cross train, have super easy running days or just focus on your recovery. The rest can actually help you become more fit. Mix things up - Bust boredom by running a different route for a change of scenery and terrain. Instead of doing speed work on a track, go to your local park and run a few fartleks instead. Running with a friend can also increase your motivation or at least take your mind off the miles! Fleet Feet Hoboken hosts weekly fun runs where you can meet new training buddies. Massage - Spending 10 – 15 minutes a day using a foam roller can keep you feeling fit and healthy. It will ease aches, pains and any tight spots that creep up. We have a variety of foam rollers and sticks to help get the kinks out. You can also treat yourself to a sports massage and let the masseuse know you’re training for a marathon. Plan massages around an easy run so you can shake out any residual soreness and don’t schedule one too close to your actual event. Ice Baths - No, we don’t mean the Ice Bucket Challenge. Fill your tub with enough cold water to cover your legs. Climb in and once you acclimate add at least two bags of ice. We know it sounds like punishment but 10 minutes of sitting in an ice bath calms all hot spots and leaves you feeling rejuvenated. You can leave your running shorts and socks on if necessary! Compression gear - Compression shorts, tights and socks serve dual purposes during marathon training. During long runs, achy legs can use the extra support that compression gear provides. They help keep the blood flowing and reduce muscle fatigue. The same compression wear also can speed post-run recovery. After you stretch and ice, throwing on compression socks or calf sleeves can reduce any swelling and make you feel refreshed. We have a variety of compression wear to choose from!